Digitakt And Virus Ti in DawLess setup... stable? My Digitakt and Virus TI Snow have some problem sometimes about Sound Pattern selection(sequencer mode). In the Digitakt, 4 Midi tracks are configured with Channel (1 to 4), Bank and Prog to get the sound I want to sequence. It works, that’s great…BUT sometimes the virus Ti Snow requires to be rebooted because DSP or whatever got stuck and the correct sound is not assigned to its midi tracks. Question: Does anyone have been using the Digitakt with any Virus TI device in this way and got a stable setup ? Is it a problem with all Virus Ti Snow ? Thanks in advance for your experience ! I have been using DT and snow together? Seems stable enough and have had no crashes …? I had it set up with a single midi cable and had DT channel A and B for Snow voice 1, C and D for voice 2, E and F voice 3 and G and H for voice 4… giving lots of control! 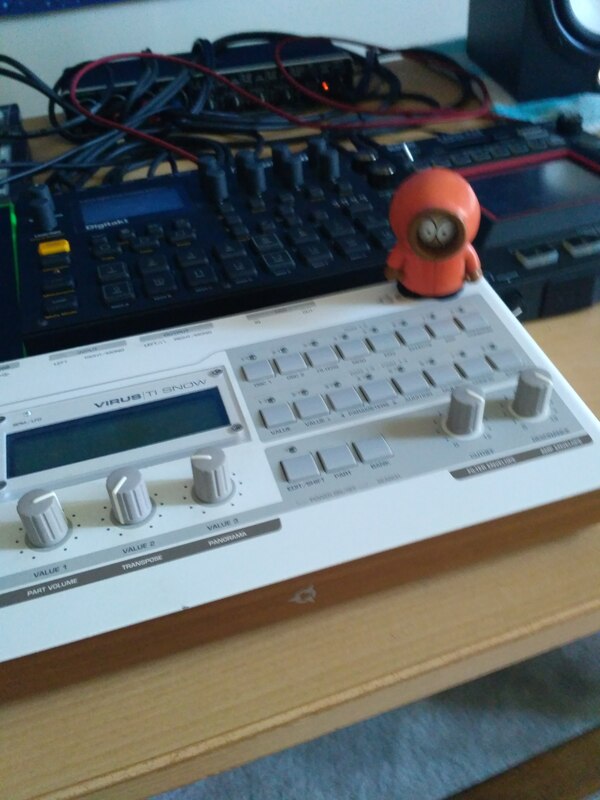 I sent my DT to elektron with a seperate issue and it has been replaced. And i cant get my back ups to reinstall. To see how it was set up? But it was just a one way midi out from DT. I will try with my new DT however have you tried a brand new clean slate project on the DT to see if you have a project related issue? When i had my sub phatty plugged in the same way i would get a hang in one project but no others? How is your dt and virus patched and configured? I just checked with a Control Midi App the outgoing signal from the DT and it may that the way I was using LFOs was generating too much traffic. Let’s see if triggerless parameter locking provided so better results. Problem is not related with any project so far. Right now , DT is configured in the same way as you explained(Midi Channels per Midi tracks); only are specified SRC-> CHAN, BANK and PROG for each midi track. LFOs have been removed. Virus TI Snow is in Sequencer Mode and Midi Program Change is Enabled. So far, no problem yet. Can you give some tips about the way you are modulating your Midi tracks ? TriggerLess parameter locking ? LFOs ? Sequencer Mode or Multi ? I have had this trying to send multiple lfos to volcas using FL2.0 and a motu midi interface…its gliched and spluttered but trying the same from the dt to the volcas worked really well i ran out of parameters to automate. Let me try…and let me look at bit rates for midi conversion on each device…stab in the dark. “Triggless p locks of the floss” ! Nice ! Good tip, I Iike a lot this idea, it will be put in practice today ! Concerning the Wavetable position, I checked in the Virus CC midi list, Can’t find it. Which CC number is it ? Will be nice to know until which point you have been able to move the midi crash test, Thanks Adam9. Ah Yeh its not called wave table index in the MIDI CC appendix as that terminology is only specific to wave table OSC types, and as you know you can choose from MANY osc types…so its called waveshape/index or something. OSC Main Volume CC 36 (goes into saturation from 100 to 127!!! so if you set the saturation curve in the filter section as a wave shaper or bit crusher you blend between gnarly and gnarlier in a very rhythmic Elektron way)… going into and out of saturation or digital distortion in a fraction division of the bpm. Saying all that dont forget the virus has a complex matrix and 3 LFOs as part of its architecture, Which are very controllable and have access to more parameters than the direct MIDI in limits…So… you can also set A Digitakt send CC of 87 (virus LFO 2 to FM amount) and a second Digitakt send of CC79 (Virus LFO 2 Rate) and let the DT control the internal LFOs of the Virus…you could seta 3rd Digitakt CC52 to switch up the shape of the LFO rhythmically or switch filter types LP HP etc…using this method you can control the filters with the Virus internal LFO2…the amounts can be accessed through CC88 and CC89 and the LFO Rate again is controllable through CC79…etc etc etc Letting the Virus do the work internally and maybe solving any of the above mentioned MIDI overflow as the data sent is a far less continuous stream…! the above parameters are always the same in each patch so its a great start point for a Digitakt Template. Then control the Virus LFO 1 the same way as above letting the virus do the LFO and the DT Plocking the changes with the beat. Thats just one of six slots available!! have fun…! That’s really great Adam, thanks so much for sharing your tips with so much details. I take good note of that. I want to chain various Digitakt patterns. Each pattern uses its own set of sounds and midi CC programs (MIDI X -> SRC -> CHAN, BANK & PROG defined for each Snow part). The problem is when I pass from a pattern to another one, the Sow take tooooooo much time to react, last snow program is still playing while the requested one is not here yet. My goal is to be able to do a live with only Digitakt and Snow using many sounds of the snow (not only 4). Did you find a way do this or to avoid it ? Then say you want to change from pattern 10 to 12 you would have a duplicate of 10 copied to 11 with the added program change cc plocked. Not sure about this but give it a try and let me know. People have mentioned that program changes plocked into the midi tracks have a two step latency. Maybe that will help. I just ordered a Virus ti snow for make darkpsy / hi tech et acid live with my digitakt. See you soon on this post if i have a problem. Hello Adam, I have a problem with Virus Ti snow. I receveid yesterday and it work great but today, I put on et there are no sound in output. Do you know what is the problem ? Can you explain how you have it set up? if you have a PC running? or is it just DT direct to the Snow? are you running VIRUS TI software and if so are the outputs configured to USB or OUTPUT? Tell me more about how you have it set up and we can look at what it might be.